The LEGO Super Heroes have new adventures. They decided to take part in the tournament of battles on super heroic vehicles and compete versus the supervillains. You have a chance to join them and help them to clear the world from the evil. Are you ready to take this challenge? If you always wanted to be a super hero, you will certainly like this game. 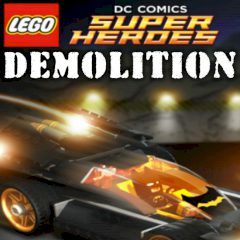 In this action game, developed by LEGO, you have possibility to become a real Super Hero and take part at the breathtaking adventures. Your mission is to destroy the supervillains on your car or bike or other vehicles. Go on the arena of the tournament and destroy the bad guys without a pity. Or they will kill you. In this game you will face lot of enemies and every next enemy will become harder to kill. So, get ready to show all your super heroic skills, courage and desire to win to reach success. The challenge will be difficult, but only persistent can win! Are you ready to save the world? You the last hope of the humanity to survive! Good luck!